THOUSAND OAKS, Calif., Nov. 29, 2017 /PRNewswire/ -- Amgen (NASDAQ: AMGN) today announced that the New England Journal of Medicine (NEJM) published positive results from the six-month Phase 3 STRIVE study evaluating Aimovig™ (erenumab) versus placebo for the prevention of episodic migraine (between four and 14 migraine days per month). Aimovig delivered clinically meaningful and statistically significant differences from placebo for all primary and secondary endpoints in the study. Patients taking Aimovig experienced a significant reduction in mean monthly migraine days and were significantly more likely to achieve a 50 percent or greater reduction in monthly migraine days than those taking placebo. Patients reported significant improvements on key measures assessing the impact of migraine on their lives when taking Aimovig, based on the Migraine Physical Function Impact Diary (MPFID) – a novel patient-reported outcomes instrument validated to specifically measure the impact of migraine on physical functioning. 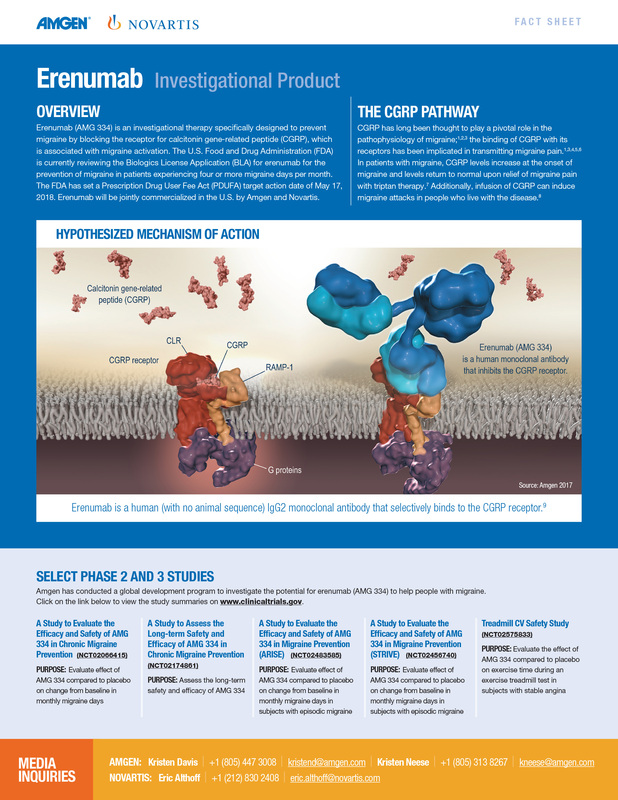 Aimovig is the first and only fully human monoclonal antibody designed to specifically block the calcitonin gene-related peptide (CGRP) receptor; CGRP plays a critical role in migraine activation. To view the Multimedia News Release, go to: https://www.multivu.com/players/English/8004555-amgen-aimovig-erenumab-phase3-strive-study-migraines/. "STRIVE is the first fully reported Phase 3 study of the CGRP pathway monoclonal antibodies, and it clearly shows that blocking this pathway can reduce the impact of migraine," said Peter Goadsby, M.D., Ph.D., FAHS, director, NIHR-Wellcome Trust King's Clinical Research Facility and professor of Neurology, King's College Hospital, London. "The results of STRIVE represent a real transition for migraine patients from poorly understood, repurposed treatments, to a specific migraine-designed therapy. 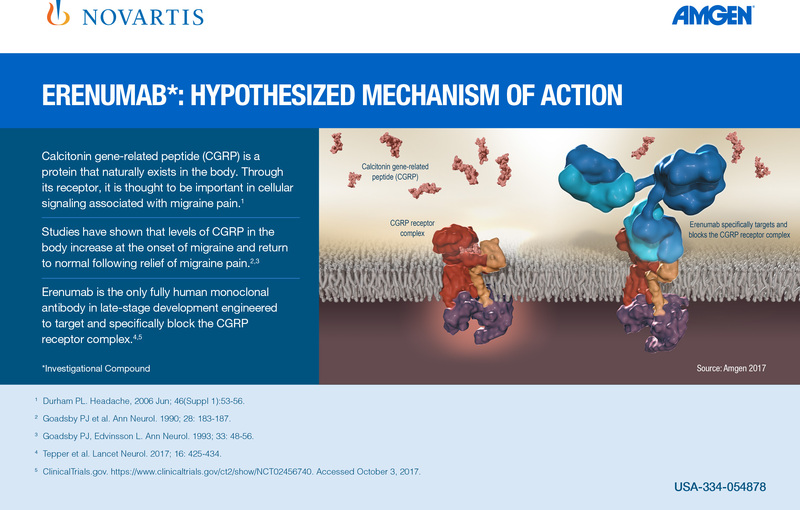 STRIVE, as with the monoclonal antibody developments generally, represents an incredibly important step forward for migraine understanding and migraine treatment." STRIVE enrolled 955 patients experiencing a mean baseline of 8.3 monthly migraine days, who were randomized to receive either placebo or subcutaneous Aimovig 140 mg or 70 mg once a month, for six months. Patients taking Aimovig at the higher dose experienced a significant 3.7-day reduction in monthly migraine days (3.2-day reduction with 70 mg, 1.8-day reduction with placebo; p<0.001 for both doses versus placebo). Fifty percent of patients taking Aimovig 140 mg had their migraine days cut by 50 percent or greater, representing a significantly higher likelihood of achieving this response compared to placebo (43.3 percent at 70 mg and 26.6 percent with placebo; odds ratios of 2.8 and 2.1 respectively for 140 mg and 70 mg; p<0.001 for both doses versus placebo). All STRIVE endpoints were assessed from baseline to the average of the last three months of the double-blind treatment phase of the study (months 4, 5, 6). "There is a clear unmet need for efficacious, innovative therapies for the prevention of migraine. Publication of these data underscores the significance of the CGRP receptor blocker Aimovig as potentially the first available treatment targeting a pathophysiologically relevant pathway for one of the most common causes of disability across the globe," said Sean E. Harper, M.D., executive vice president of Research and Development at Amgen. "We look forward to advancing our robust clinical program for Aimovig in order to help ease the burden of this devastating disease and to best support the migraine patient community." Patients taking Aimovig had significant reductions in the number of days per month using an acute or "rescue" migraine-specific medication compared to those taking placebo (1.6 days with 140 mg and 1.1 days with 70 mg group, compared to 0.2-day reduction with placebo; both doses p<0.001 versus placebo). In the STRIVE study, the overall safety and tolerability profiles of Aimovig were similar to that of placebo. Adverse events occurring in greater than five percent of all treatment arms were nasopharyngitis and upper respiratory tract infection. More than 90 percent of patients in the Aimovig-treated arms completed the six-month study. Adverse events leading to discontinuation of treatment occurred in 2.2 percent of patients in either Aimovig treatment arm and in 2.5 percent of patients receiving placebo. STRIVE contributes to an extensive body of evidence in support of the efficacy, safety and tolerability profile of Aimovig, including four placebo-controlled Phase 2 and Phase 3 clinical studies involving more than 2,600 patients, as well as open-label extensions up to five years in duration. Aimovig is the first and only investigational therapy targeting the CGRP pathway to have received FDA and European Medicines Agency (EMA) regulatory filing acceptance to date. The Phase 3 STRIVE study is one of the pivotal studies included in the U.S. and European regulatory applications under review for Aimovig. If approved, Amgen and Novartis will co-commercialize Aimovig in the U.S. Amgen has exclusive commercialization rights to the drug in Japan and Novartis has exclusive rights to commercialize in rest of world. STRIVE (Study to Evaluate the Efficacy and Safety of Erenumab in Migraine Prevention, NCT02456740) is a global Phase 3, multicenter, randomized 24-week, double-blind, placebo-controlled study evaluating the safety and efficacy of Aimovig in episodic migraine (characterized in this study as ≥4 to <15 migraine days per month and <15 headache days per month on average across the three months before screening) prevention. In the study, 955 patients were randomized to receive once-monthly subcutaneous placebo, or Aimovig (70 mg or 140 mg) in a 1:1:1 ratio. Patients experienced between four and 14 migraine days each month, with an average of 8.3 migraine days per month at baseline. The primary endpoint was change in mean monthly migraine days from baseline over the last three months of the double-blind treatment phase of the study (months 4, 5 and 6). Secondary study endpoints assessed at six months included reduction of at least 50 percent from baseline in mean monthly migraine days, change from baseline in mean monthly acute migraine-specific medication days, and reductions from baseline in both mean impact on everyday activities domain and mean physical impairment domain scores on the Migraine Physical Function Impact Diary (MPFID). Aimovig is the only treatment specifically designed to prevent migraine by blocking the CGRP receptor, which is associated with migraine activation. Aimovig has been studied in several large global, randomized, double-blind, placebo-controlled studies to assess its safety and efficacy in migraine prevention. More than 2,600 patients have participated in the Aimovig clinical program across the four placebo-controlled Phase 2 and Phase 3 clinical studies and their open-label extensions. Regulatory submissions have been filed in the U.S. and Europe. The FDA has set a Prescription Drug User Fee Act (PDUFA) target action date of May 17, 2018. People with frequent migraine may lose more than half their life to migraine days.3 Migraine robs individuals of time with their families, productivity at home and at work, and their livelihoods. Migraine sufferers endure debilitating pain, physical impairment, and live in constant dread of the next attack – all of which is compounded by a widespread misperception of the disease.4 The World Health Organization ranks migraine as one of the most debilitating illnesses.4 For the approximately 10 million Americans whose migraine frequency or severity impacts daily activities, preventive medications may be an option.5 Approximately 3.5 million of these patients are currently on a preventive therapy, but up to 80 percent discontinue these within one year.6,7 Migraine is associated with personal and societal burdens of pain, disability, and financial cost, and it remains under-recognized and under-treated. In August 2015, Amgen entered into a global collaboration with Novartis to develop and commercialize pioneering treatments in the field of migraine and Alzheimer's disease. The collaboration focuses on investigational Amgen drugs in the migraine field, including Aimovig (Biologics License Application submitted to FDA in May 2017) and AMG 301 (currently in Phase 2 development). In April 2017, the collaboration was expanded to include co-commercialization of Aimovig in the U.S. For the migraine program, Amgen retains exclusive commercialization rights in Japan, and Novartis has exclusive commercialization rights in Europe, Canada and rest of world. Also, the companies are collaborating in the development and commercialization of a beta-secretase 1 (BACE) inhibitor program in Alzheimer's disease. The oral therapy CNP520 (currently in Phase 3 for Alzheimer's disease) is the lead molecule and further compounds from both companies' pre-clinical BACE inhibitor programs may be considered as follow-on molecules. Our results may be affected by our ability to successfully market both new and existing products domestically and internationally, clinical and regulatory developments involving current and future products, sales growth of recently launched products, competition from other products including biosimilars, difficulties or delays in manufacturing our products and global economic conditions. In addition, sales of our products are affected by pricing pressure, political and public scrutiny and reimbursement policies imposed by third-party payers, including governments, private insurance plans and managed care providers and may be affected by regulatory, clinical and guideline developments and domestic and international trends toward managed care and healthcare cost containment. Furthermore, our research, testing, pricing, marketing and other operations are subject to extensive regulation by domestic and foreign government regulatory authorities. Our business may be impacted by government investigations, litigation and product liability claims. In addition, our business may be impacted by the adoption of new tax legislation or exposure to additional tax liabilities. If we fail to meet the compliance obligations in the corporate integrity agreement between us and the U.S. government, we could become subject to significant sanctions. Further, while we routinely obtain patents for our products and technology, the protection offered by our patents and patent applications may be challenged, invalidated or circumvented by our competitors, or we may fail to prevail in present and future intellectual property litigation. We perform a substantial amount of our commercial manufacturing activities at a few key facilities, including Puerto Rico, and also depend on third parties for a portion of our manufacturing activities, and limits on supply may constrain sales of certain of our current products and product candidate development. In addition, we compete with other companies with respect to many of our marketed products as well as for the discovery and development of new products. Further, some raw materials, medical devices and component parts for our products are supplied by sole third-party suppliers. Certain of our distributors, customers and payers have substantial purchasing leverage in their dealings with us. The discovery of significant problems with a product similar to one of our products that implicate an entire class of products could have a material adverse effect on sales of the affected products and on our business and results of operations. Our efforts to acquire other companies or products and to integrate the operations of companies we have acquired may not be successful. We may not be able to access the capital and credit markets on terms that are favorable to us, or at all. We are increasingly dependent on information technology systems, infrastructure and data security. Our stock price is volatile and may be affected by a number of events. Our business performance could affect or limit the ability of our Board of Directors to declare a dividend or our ability to pay a dividend or repurchase our common stock. *The trade name Aimovig™ is provisionally approved for use by the U.S. Food and Drug Administration.The scientific information discussed in this news release related to our product candidates ispreliminary and investigative. 1 Kawata, et al. Presented at 69th Annual Meeting of the American Academy of Neurology; April 22-28, 2017; Boston, MA. 2 Roberts L, et al. Methods for Addressing Challenges for Evaluating Patient-Reported Outcomes in Clinical Trials of Prophylactic Treatments for Migraines. Presented at 58th Annual Meeting of the American Headache Society; June 9-12, 2016; San Diego, CA. 3 Lipton RB, et al. 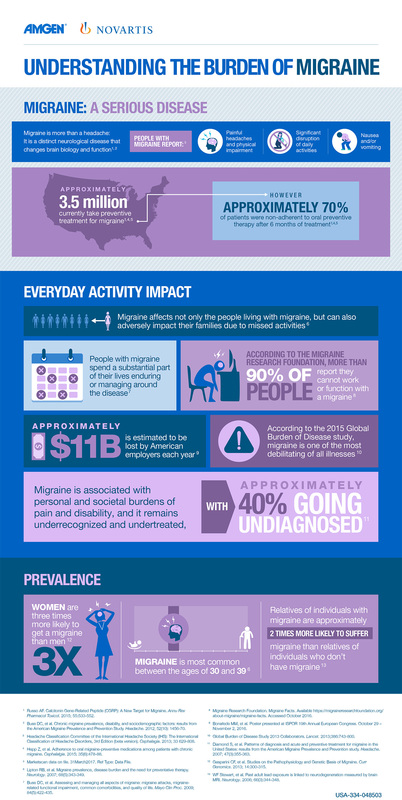 Migraine prevalence, disease burden, and the need for preventative therapy. Neurology. 2007; 68(5):343-9. 5 Headache disorders - Fact sheets. World Health Organization. http://www.who.int/mediacentre/factsheets/fs277/en/. Accessed September 17, 2017. 7 Hepp Z et al. Adherence to oral migraine-preventive medications among patients with chronic migraine. Cephalalgia. 2015; 35(6):478-88.